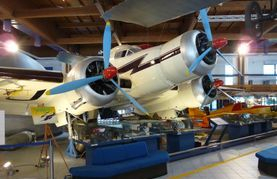 The SM.79 was originally designed as a passenger aircraft and in 1937-39, it set 26 world records to become the fastest medium bomber in the world. It was the most important Italian bomber of World War II, and established a reputation that contrasted with most Italian weapons of the day. SM.79s served widely in the normal bombing role, but it is as a land-based torpedo bomber that the type deserves its place in military aviation history. Regarded by many as one of the finest torpedo bombers of the war, it served with distinction and was flown with courage and skill. Painted in civil or military markings, the prototype appeared in late 1934 and subsequently had a varied career, setting records and winning races with various engines. The SM.79 had a distinctive 'hump' on the upper forward fuselage, which housed both the fixed forward-firing heavy machine-gun and the dorsal gunner's position. 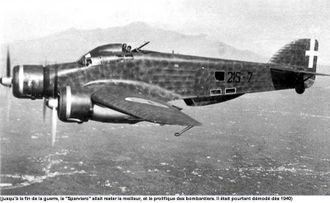 Its appearance earned the aircraft the nickname 'Gobbo Maleditto' ('Damned Hunchback'). In spite of its cumbersome appearance and outdated steel tube/wood/fabric construction, the SM.79 was a rugged, reliable multi-role medium bomber which did quite a bit of damage in the face of heavy opposition. Developed from a civil airliner, the first Sparvieros (Sparrowhawk) entered service with the Regia Aeronautica in late 1936, just in time to fly combat over Spain with the Aviacion Legionaria, the Italian contingent fighting in support of the Nationalists. 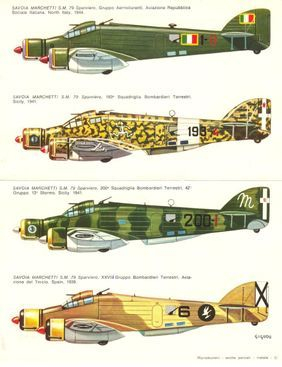 The SM.79-I established an excellent reputation in combat with the Aviacion Legionaria in Spain in 1936-1939. Its performance drew favorable comments from both sides, leading to a succession of export orders. 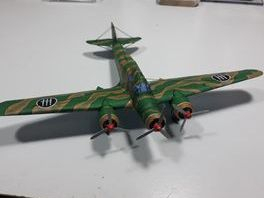 The SM.79-I served with the Italian Aviazione Legionaria in support of Franco in the Spanish Civil War.